The macroscopic and microscopic subparallel fracturing yet described in the other chapters, is a regular companion to the pock-marked and cratered cobbles in the Buntsandstein conglomerates. The assumption both features are related with each other has been confirmed by the shock experiments. Fig. 1. Typical in situ subparallel fracturing in quartzite cobbles of the Buntsandstein basal conglomerates. The tensile character of most of the joints is obvious. No displacements due to shearing can be observed. Fig. 2. 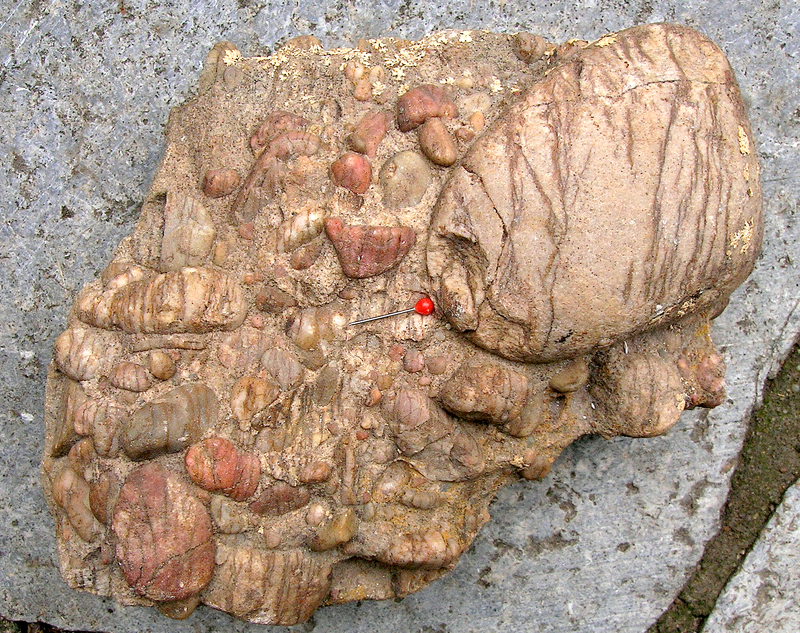 Sample of the quartzite conglomerate revealing the subparallel fracturing – click to enlarge. As shown in Fig. 32 of the chapter on Surface features at least several cracks appear to have resulted from spallation fracturing, and we remind of the possibility that spallation my have been an important factor of the subparallel tensile jointing. In an outcrop, the strike of the fracturing is rather homogeneous, but there is no regional trend. Strike directions in outcrops only few hundred meters apart may differ significantly (also see below). In several outcrops, a second set subordinate and roughly normal to the master set is observed. Despite their general strike consistency, the fractures do not have the character of systematic joints. They are mostly irregular, curved and bifurcated. The spacing is of the order of millimeters and seems to be independent of the cobble size. The fractures formed in opening mode and, therefore, are tensile fractures. Fracture-parallel displacements are extremely rare and obviously occur only in faults. The surfaces of even strongly fractured cobbles are remarkably smooth. Traditionally, the subparallel and closely spaced tensile fracturing of the cobbles might be interpreted tectonically as having developed parallel to the largest compressive stress. In fact, such deformed conglomerates are rarely observed, which is explained by preferential shear stress and displacements between the components. In a study of conglomerates in California and Israel, Eidelman & Reches (1992) show that subparallel tensile fractures in poorly cemented cobbles may well develop, even in a compressive state of stress, and thus seem to be excellent indicators of regional tectonic stress. Basically, the subparallel fracturing of the Buntsandstein conglomerates has a bit in common with the conglomerates studied by Eidelman & Reches (1992). 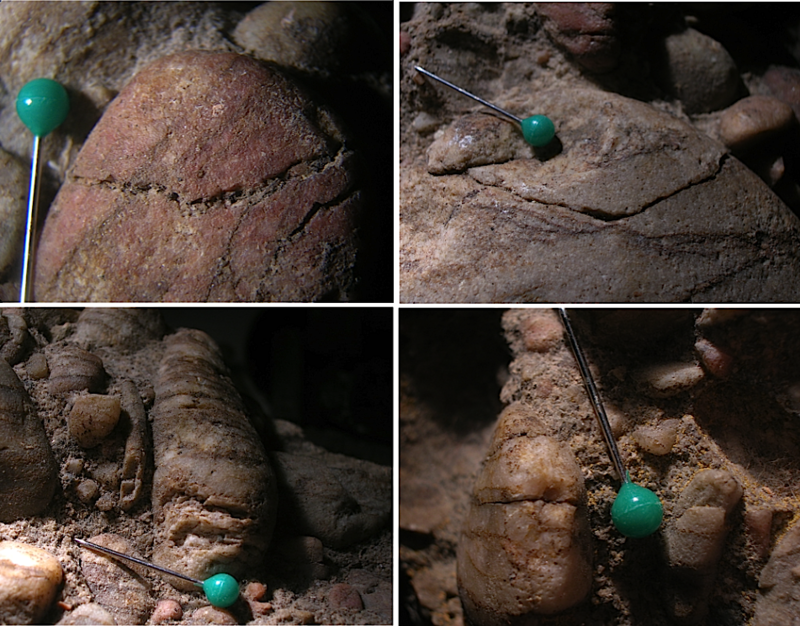 Major differences are the (macro-)fracture spacing which is one or two orders of magnitude less in the Buntsandstein cobbles, the non-systematic character of the master tensile joints, and the missing regional trend. These differences and the thin-section observations of multiple sets of decorated microfractures suggest a formation other than by conventional tectonic stress. Both macroscopic and microscopic subparallel fracturing have been reported from several terrestrial impact structures, however without consistent models of formation. We first refer to the paper of Albat & Mayer (1989) on conjugate systems of densely spaced s-surfaces in the Vredefort impact structure obviously related with shatter cones. A short study by Reiff (1979) on “subparallel shock fractures” in the Steinheim Basin impact structure also relates the fracturing with shatter coning. In the opinion of Reiff, the subparallel fracturing is oriented parallel to shatter cone axes and thus could have formed by compressive shock waves. 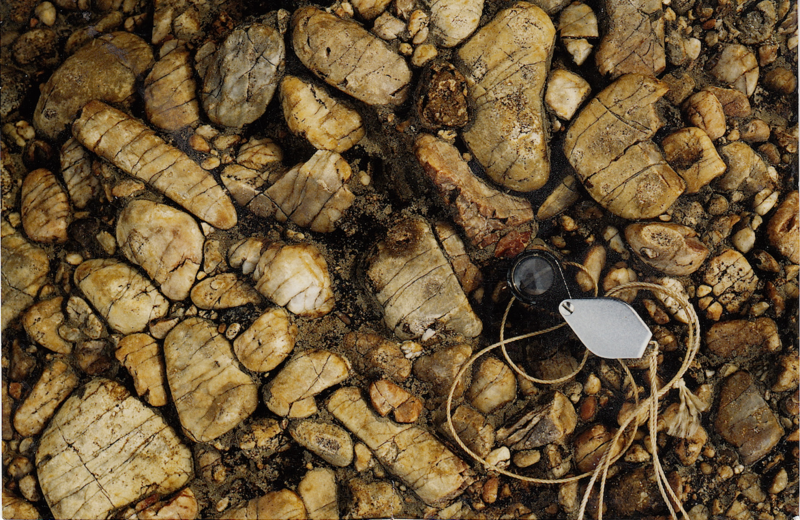 A “shatter cleavage” in a sandstone from the Gosses Bluff impact structure very similar to the above-mentioned Vredefort occurrences is shown in a paper by Milton (1977). 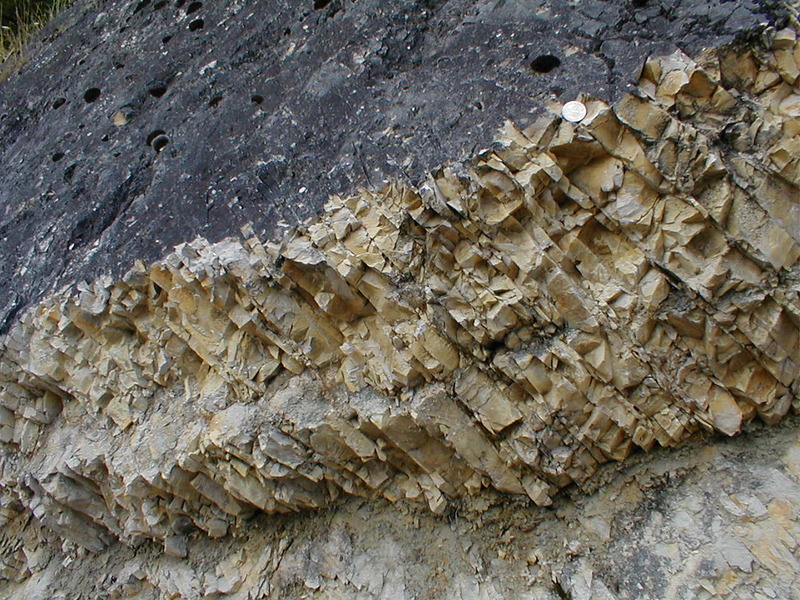 The macroscopic quartz cleavage from Saint-Paul-la-Roche near the Rochechouart impact structure has been discussed (Kraut 1969) also as a possible result of the impact. In the Azuara impact structure, we observed densely spaced subparallel fracturing to occur in Malmian marls (margas negras) (photo). In the Ries impact structure an impact-induced platy jointing is observed to occur in the Gosheim disused quarry at the crater rim (photo). Microscopic subparallel intergranular fractures have been reported for, e.g., the Deep Bay crater (Robertson et al. 1968) and the Ries impact structure (Chao 1977). According to Chao, major sets of subparallel intergranular fractures are related spatially to the applied stress and, in the case of the Ries impact, are radial or concentric to the impact point. Intergranular subparallel microfractures have also reported for granodiorites shocked in the Harthat nuclear experiment (Short 1968). 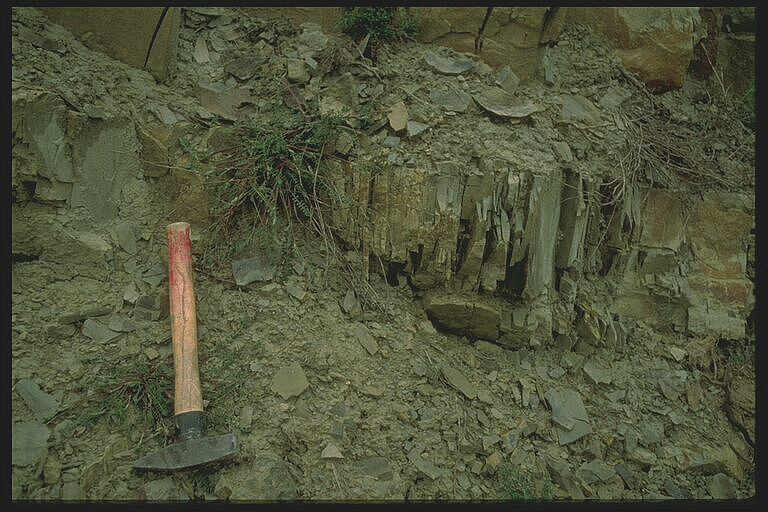 Subparallel fracturing known from several impact structures and observed in the Buntsandstein conglomeratic layers suggests that the latter has not a tectonic origin but formed in the same shock event as did the cobble cratering. We repeat the features more compatible with a dynamic deformation than with regional tectonic stress, which are the non-systematic character of the tensile joints, the non-regional trend of their strike, the extremely smooth surfaces of the fractured cobbles even if they are densely packed, and the multiple sets of subparallel microfractures decorated with fluid inclusions, which were trapped at elevated temperatures. In the image below, the result of a field investigation of the strike directions of closely spaced joint sets in Buntsandstein conglomerates west, southwest and east of the Rubielos de la Cérida impact structure is plotted. The plot confirms the lack of a regional trend, and the strike may be considered roughly tangential and radial with respect to the rim of the Rubielos de la Cérida structure. This pattern reminds of the statement (Chao 1977; see above) that microfracturing in rocks from the Ries impact structure is spatial related to the impact point and that tangential and radial strike directions can be observed. Moreover, in the shock experiments on the quartz spheres, sets of fractures especially parallel and perpendicular to the impact trajectory have developed. We add that in the image below, we have plotted the macroscopically dominant set of fractures only and that a systematic analysis of the relation between this set and a perpendicular set sometimes developed (see above) is so far outstanding. Fig. 3. Strike orientation of macroscopic subparallel fracturing in quartzite cobbles in Buntsandstein conglomerates. A. 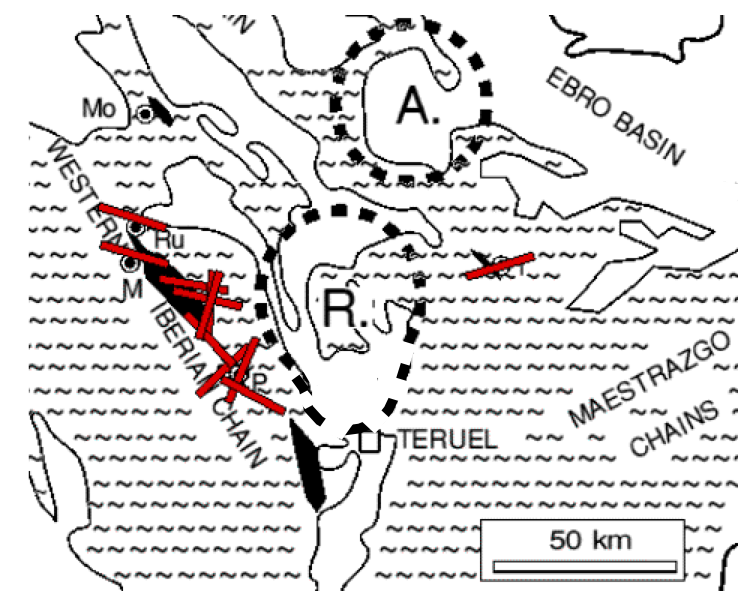 = Azuara impact structure, R. = Rubielos de la Cérida impact basin; Mo = Monasterio de Piedra, Ru = Rueda, M =Molina de Aragón, P = Peracense. Note that only the direction of the major set of subparallel fracturing has been plotted. Summarizing, we suggest that the peculiar macro- and micro-fracturing of the cobbles from the Buntsandstein basal conglomerates is related with the Azuara and especially with the Rubielos de la Cérida impact structures. Shock waves and rarefaction waves starting from the impact target around the present Rubielos de la Cérida village are regarded as to have caused the damage of the cobbles in the form of the subparallel fracturing. This dynamic model explains most of the observations presented here much better than does a tectonic model.